I'm sharing my favorite snack hacks! The key to this is PORTION CONTROL. You may not think another handful would make a difference, but times that handful by seven days or 30 days and before you know it, you've snacked your way to 7,000 calories LOL! I don't believe in deprivation, I do believe in healthy choices and making sure those choices stay available to you. 1. WATER- I know I know... I would think the same thing every time my mum would tell me to drink water when I thought I was hungry... “whatever mum” lol. But honestly, as an adult, I can admit that this is the essential snack to have available at the ready, all the time. Drinking enough water has made a massive difference in my skin and even my sleep. It helps flush toxins from your body naturally. Being dehydrated can easily cause you to snack more because you think you're hungry when actually you lack energy because you're thirsty. You know those days where you’re hungry and nothing satisfies you, everything isn’t the taste you want, and nothing feels right going down? Yup, dehydration. Remember to drink before you're thirsty, feeling thirsty is a sign you are already dehydrated. Drinking water before meals and snack helps fill up your stomach so you won't feel as hungry, overeat or be inclined to choose something you'll regret later. That old wives tale of don’t drink too much with your dinner is gone... drink away!!! (Water that is.. not wine my loves) Put a lemon slice in there for extra vitamins and benefits, in summer I sometimes like to put cucumber and mint leaves in my water... so yummy and refreshing. Do what you have to do, count your glasses, get an app, but just do it. Just try to push a little more each day, kind of like when you work out. There are days when I just want the saltiest packet of Lays original I can find, cut to 10min later I feel disgusting, and I have instant regret. This snack saves me from that. Once you get used to them, these 30 calorie snacks are the perfect replacement for a bad potato chip habit. So I get a little saltiness, but also, an excellent dose of micronutrients including folate, calcium, magnesium, zinc, iron, and selenium. Seaweed is an excellent source of iodine which is especially helpful in hormone regulation, metabolism and more. 3. A bowl of sliced cucumbers, squeeze of lemon, salt, and Tajin or another seasoning you love. For less than a 100 calories you can have two cups of this fresh and satisfying snack. *bonus* high water content and soothing for the skin. OR a bowl of baby tomatoes chopped basil and balsamic- S+P to taste. Packed with heart-healthy Lycopene from the tomatoes, this is a guilt-free way to snack on when dinner can't come fast enough. 4. Rice cakes and almond butter and a little bit of honey- seriously SO good, any time of day. I love almond butter, peanut butter, sometimes with pretzels. A nice salty crunch and the protein in the butter helps keeps me fuller, longer. Portion control is a big deal with this one, don’t be excessive! It’s not a whole jar of almond butter and an entire packet of rice cakes (it’s been done trust me) I recommend only two rice cakes or a handful of pretzels. Then, drink water to help it expand in your tummy and fill you up. If you’re using pretzels I like to warm up my peanut/almond butter, it softens it and makes it's like a dip instead of a spread. If you want to be super healthy, switch out the pretzels and rice cakes for celery sticks, my mum used to send me to school with this, and it was always my fave thing in my lunch box! 5. My midnight snack hack- Herbal tea with a 1/2 Tablespoon of coconut oil and honey. MUST BLEND, trust me, it makes all the difference. Blending makes the tea frothy and more like a luscious, creamy latte rather than an everyday tea. The sweetness helps me swap it for a dessert, so my sweet tooth is happy. *Bonus points* Choose chamomile tea, and you'll relax your way straight to sleep. Do you want more snack hacks? Comment below about your favorite snacks and maybe I'll give yours a try too. Stay up-to-date on all the things when you sign up for my email newsletter! 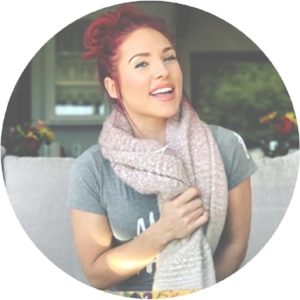 SharnaBurgess.com is for informational purposes only. No express or implied warranties of any type are made with respect to the information and products described on this web site. We specifically disclaim liability for incidental or consequential damages and assume no responsibility or liability for any loss or damage suffered by any person as a result of the use or misuse of any of the information or products on this web site.